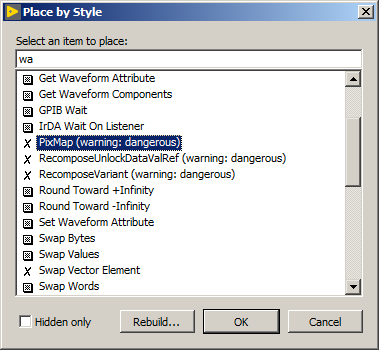 There are a bunch of objects in LabVIEW that aren't exposed in the default palettes, and are normally inaccessible except through scripting. I made a Quick Drop plugin that exposes all of these. Many of these are no longer supported, and others never were supported in the first place. Hidden ones are displayed with an "X" next to them to warn you: as I often say, be careful with these, and don't use them in any code you care about, as they can cause crashes, data corruption, and who knows what else! Download the LLB below and place it in your <LabVIEW install dir>\resource\dialog\QuickDrop\plugins folder. Then press Ctrl+Space, Ctrl+S to open this dialog. Select an item from the list and click OK, and there you go. There's some interesting/strange stuff in here! EDIT: Couple things I forgot to mention. The first time you open this (and whenever you rebuild the list) it uses two private properties on the app reference, to get the list of controls and indicators in the palette. Since this is just a property read, I'm sure the worst that could happen is a crash when you try to open the dialog, but I can't make any guarantees. Also there's some false positives for hidden items, mainly with front panel controls/indicators that come in different styles.